Bridges are getting a lot of attention as senators add their two cents to the upper chamber’s transportation budget proposal for next year. The Senate transportation appropriations bill includes $500 million for “bridges in critical corridors” (BRICC), designed as a response to the recent bridge collapse along I-5 in Washington state — home of Senator Patty Murray, the chair of the Transportation and HUD Appropriations Committee. And in the amendment process, Republican senators have been lining up to mold the BRICC program to their liking. Sen. Rob Portman (R-OH) got an amendment inserted that would prioritize spending that money on functionally obsolete or structurally deficient bridges. And Rand Paul loves the new BRICC program so much he wants to raid the very tiny, very popular Transportation Alternatives program to prop it up. Both Paul’s and Portman’s amendments are aimed at the same thing: widening the Brent Spence bridge between their two states. The project is so high-profile that President Obama stood under the bridge to make his infrastructure push in 2011. While the Brent Spence Bridge is “functional obsolete” — in other words, congested — it is not structurally deficient. In fact, the bridge is perfectly safe. As of its last inspection in 2005, it got good ratings for deck condition, superstructure condition, and substructure condition. Paul and Portman aren’t the only Republicans looking to put their imprint on BRICC. Oklahoma Republican James Inhofe wants to make sure at least 20 percent of that money goes to rural areas. And Louisiana’s David Vitter is pushing to waive environmental reviews for any project funded by BRICC. 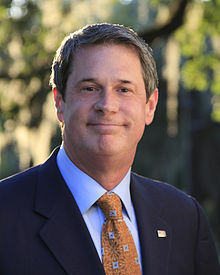 Vitter’s amendment [PDF] would make all BRICC projects eligible for a “categorical exclusion” from the requirements of the National Environmental Protection Act. That means they wouldn’t have to undergo scrutiny of their environmental and community impacts or any evaluation of alternatives. If all bridge projects under BRICC were going to replace bridges with their exact replica, with no changes, then sure, NEPA reviews might be superfluous. But the amendment would exempt projects as massive as New York’s Tappan Zee Bridge replacement — which will nearly double the width of the existing bridge without adding any dedicated transit component — from environmental review. And BRICC projects aren’t necessarily repair or replacement projects — they can be brand-new construction on Federal-aid highways. The Vitter amendment would continue what Republicans started in the recently-passed MAP-21 — the evisceration of environmental review for transportation projects. The law weakened NEPA by excluding several types of transportation projects from environmental review. And even before MAP-21, only the biggest, costliest, and most complicated transportation projects — about 3 percent of all projects — triggered a NEPA requirement. The GOP seems to be trying to harness guilt about the dangerous state of the country’s bridges in order to push through all kinds of even more dangerous ideas, from de-funding active transportation to eliminating environmental reviews. As the Senate picks the bill back up today, with an eye toward passing it before they adjourn for the month-long recess on Friday, advocates will be watching Vitter’s NEPA amendment — among others that Transportation for America is tracking.